(1) College of Nursing and Health Innovation, Arizona State University. Phoenix, Arizona, USA. (2) Texas Obesity Research Center, Department of Health and Human Performance, University of Houston. USA. (3) Centro de Investigación en Nutrición y Salud, Instituto Nacional de Salud Pública. Mexico. (4) School of Kinesiology & Health Studies, Queen's University. Ontario, Canada. (5) Instituto de Ciencias Aplicadas a la Actividad Física y Deporte, Universidad de Guadalajara. Mexico. (6) Departamento Medicina Preventiva, Secretaría de Salud. Mexico. (7) Center of Health Promotion and Disease Prevention, College of Nursing and Health Innovation, Arizona State University. Phoenix, Arizona, USA. Objective. This cross sectional study aims to determine the effects of gender and parental perception of safety at school on children's physical activity (PA) levels. Materials and methods. Parents of school aged Mexican children residing in Guadalajara, Mexico City, and Puerto Vallarta, completed surveys about their children's PA measures. The physical activity indicators were evaluated using linear and logistical regression models. Results. Analysis did not indicate that gender moderated the relationship between parental perception of safety and PA measures, but significant gender issues exist with girls participating less than boys in the three measures of PA in this study (p<0.001). Conclusion. Results suggest the need for additional interventions promoting physical activity in girls in Mexico. Keywords: physical activity; parenteral perception; children; gender; safety; environment; schools; health behavior. Objetivo. Determinar los efectos de género y percepción paternal de la seguridad en escuelas, en niveles de actividad física (AF) en los niños. Material y métodos. Padres con hijos escolares residentes en Guadalajara, Ciudad de México, y Puerto Vallarta, completaron encuestas sobre los niveles de AF de sus hijos. Se evaluaron los indicadores de AF usando modelos de regresión lineal y logística. Resultados. El análisis no indica que el género modere la relación entre percepción de seguridad y medidas de AF, pero hay indicadores significativos de que las niñas participan menos que los varones en las medidas de AF de este estudio (p<0.001). Conclusión. Los resultados sugieren la necesidad de intervenciones adicionales que promuevan la AF en niñas mexicanas. Palabras clave: actividad física; percepción de los padres; niños; género; seguridad; ambiente; escuelas; conducta de salud. 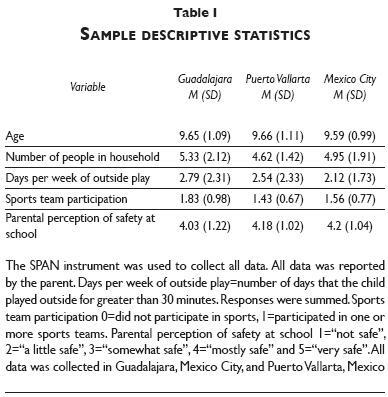 Some studies have not found a significant relationship between parental perception of neighborhood safety and children's physical activity levels.11 In a study of adults in Cuernavaca, Mexico, neighborhood safety perception was not associated with PA despite high crime rates.12 More research is needed to examine the impact of perception of safety on children's physical activity levels. Gender plays a role in children's levels of PA. Jauregui13 found that Mexican boys participated an average of 143 minutes per day in MVPA while Mexican girls participated in an average of 98 minutes per day. Girls living in neighborhoods that are perceived as unsafe have been found to have higher levels of overweight and obesity.14 Carver and colleagues found that parental restriction of children's active transport and physical activity due to safety concerns resulted in lower levels of MVPA and active transport in adolescent girls.15 Further investigation is necessary to determine whether these relationships are related to parental restriction of PA based on gender. It is important to understand the nature of parental perception of school safety and child gender in Mexico on physical activity so that evidence-based interventions may be developed to promote physical activity in this country. The primary objective of this cross sectional study was to investigate the association of parent's perception of school safety and gender on children's physical activity levels. Additionally the authors aimed to determine if gender moderated the relationship between parental perception of school safety and children's physical activity levels. Parents of school aged Mexican children in grades 3rd to 5th residing in Guadalajara, Puerto Vallarta, and Mexico City completed paper and pencil surveys. Parental consent was obtained, and children provided assent. Approval for this study was obtained from the University of Houston Committee for the Protection of Human Subjects as well as the ethics institutional review boards of Queen's University, the Mexican National Institute of Public Health (Instituto Nacional de Salud Pública), and the University of Guadalajara. Paper and pencil surveys were sent home with children for parents to complete, and the children returned the completed surveys to the school. See table I for descriptive statistics. The survey included data on 817 boys and 924 girls. Analysis was based on questions drawn from the SPAN instrument, a parent survey that measured physical activity and demographic variables.18 Similar instruments have been tested and validated.19 Independent variables included child age, child gender, child grade level, number of people residing in the household, city of residence, and parental perception of child safety at school. Parental perception of safety at school was used to measure safety because of the likelihood that children attended school near their home. In Mexico, 66.4% of 10-14 year olds walk to school.2 Perception of safety at school serves as a proxy measure of neighborhood safety. Parents responded to the question "How safe does your child feel at school?" with "not safe", "a little safe", "somewhat safe", "mostly safe" and "very safe". Three measures of physical activity were used for the dependent variables. Parents completed three questions on a self-reported questionnaire, which were scored according to established protocols. * The first indicator of PA asked parents how many days of the week the child played outside for 30 minutes or more. The number of days was summed for each respondent and recorded as a continuous variable. The second question asked how many sports teams the child had played on during the past 12 months. Responses included 0, 1, 2 or 3 or more sports teams. This variable was recoded as a binary variable. If the child had participated in one or more sports teams, it was coded as a yes, and as a no if the child had participated in 0 sports teams. The last question asked if the child currently participated in other organized physical activities or lessons in things like martial arts, dance, gymnastics, soccer, baseball, or tennis. Responses for this question were "yes" or "no". Means and standard deviations were calculated for descriptive characteristics including the age of the children, grade of the children, number of people residing in the household, and parental perception of safety at school. T tests, chi square and one way analyses of variance (ANOVA) with a Bonferoni correction were used to investigate descriptive associations among variables. Hierarchical linear and logistic regression analyses were conducted to test whether gender moderated the relationship between parental perception of child safety at school and the three PA outcomes. A p value threshold of <0.05 was used for a statistical tests. For all models, the control variables child age, child grade level, number of people living in the household, and city, were entered at step one. The independent variable gender was entered at step two. Parental perception of safety at school was entered at step three, and the interaction term between gender and parental perception of safety at school was entered at step four. To aid in interpretation of multivariate models, parental perception of safety at school was centered. A major aim of the study was to examine gender influences on measures of PA, for this reason cases with missing gender data (n=255) were dropped from the regression analysis. Cases without gender specified were compared to cases with gender specified for differences on the three indicators of PA. IBM SPSS statistics version 20 was used to run all statistical analyses. Descriptive characteristics. Parents of school aged Mexican children (M=9.63 years, SD=1.052) in grades 3rd to 5th residing in Guadalajara (n=904), Puerto Vallarta (n=225), and Mexico City (n=867) completed paper and pencil surveys. The average number of people living in the household was five (M=5.09, SD=1.974). Parents reported perception of safety at school included 2.4% as "not safe" (n=41), 10.3% as "a little safe" (n=173), 12.4% as "somewhat safe" (n=202), 22.8% as "mostly safe"(n=382), and 52% as "very safe"(n=871). Eighty-two percent of respondents (n=1591) reported that their child played for 30 minutes or more outside for one or more days of the week. Data indicated that 45.5% (n=704) of the respondents' children participated in sports teams. Thirty-nine percent (n=645) of respondents reported that their children participated in other organized PA such as dance lessons, martial arts, soccer, or gymnastics. See table II for frequencies. Bivariable analysis. Participation in outdoor play (girls M=2.28, SD=2.00 vs boys M=2.70, SD=2.21); t(1,727)=4.15, p<.001), sports teams (girls M=1.53, SD=.80 vs. boys M=1.82, SD=.93; t(1,547)=6.64, p<.001) and other organized physical activities (boys, yes=345, no=426; girls, yes=300, no=583; X2 (1, N=1,654) =20.08, p=<.001) differed significantly by gender. Anova was used to examine differences in outdoor play between cities. Participation in outside play was significantly greater for residents of Guadalajara (M=2.79, SD=2.3) than residents of Puerto Vallarta (M=2.54, SD=2.3) and Mexico City (M=2.11, SD=1.73; F(2, 1726) = 19.81, p<.001). Participation in sports teams was significantly higher for residents of Guadalajara (M=1.83, SD=.98) than residents of Puerto Vallarta (M=1.42, SD=.67) and Mexico City (M=1.56, SD=.77; F(2, 1,546) =23.81, p<.001). Residents of Mexico City reported higher average perceptions of safety at school (M=4.2, SD=1.04) than residents of Puerto Vallarta (M=4.18, SD=1.02) and Guadalajara (M=4.03, SD=1.22; F(2, 1,673) = 4.75, p<.01). Cases with missing gender data were examined for differences in the three indicators of PA. A one way anova showed significant differences in outside play between children in which gender was not specified and in children for which gender was specified (F=9.7, df=2, p<.001). Post hoc analysis using the Bonferroni criterion revealed a significant difference between children with gender not specified (M=2.8, SD=2.2) and girls (M=2.3, SD=2) p<.05 on the indicator of outdoor play. This relationship was not significant for boys (p=1.0). Results of a chi2 analysis showed significant association between gender (boys, girls, gender unspecified) and participation in sports, X2(2, N=1,642) =44.6, p<.001. A chi2 test was performed and a significant relationship was found between gender (boys, girls, gender unspecified) and participation in other organized physical activities X2(2, N=1, 764) =21.8, p<.001. Regression models. Hierarchical linear regression analyses were conducted to assess the association of gender and parental perception of safety at school with the children's PA measure of outdoor play. The results displayed in table III show that gender significantly contributed to outdoor play (t=-3.78, p<0.001). Boys were more likely to participate in outdoor play than girls. In this model, residency in Guadalajara (t=6.28, p=<0.001) and residency in Puerto Vallarta (t=3.21, p=0.001) explained a significant proportion of the variance in outdoor play when compared to Mexico City. Children residing in Guadalajara were more likely than children residing in Puerto Vallarta and Mexico City to participate in outdoor play. Child gender did not moderate the relationship between parental perception of safety at school and PA as the interaction term, gender x parental perception of safety, was not significant (t=-1.63, p=.104). The model accounted for 3.8% of the variance in outdoor play. Hierarchical logistic regression results revealed residency in Guadalajara (Wald (1)=11.7, p<.01), child age (Wald (1)=14.6, p<.001) and child gender (Wald (1), =39.8, p<.001) as significant in participation in sports teams. Older children were more likely to participate in sports than younger children. Residents of Guadalajara were more likely than residents of Puerto Vallarta and Mexico City to participate in sports teams. Girls were less likely than boys to participate in sports teams. The results of the logistic regression are presented in table IV. Logistic regression results revealed two factors as significant variables in participation in other organized physical activities. Results of this regression are presented in table V. These factors were residency in Guadalajara (Wald (1) =7.91, p=0.008, Puerto Vallarta (Wald (1) =4.07, p=0.044), and gender (Wald (1) =7.09, p<.001). These results indicated that boys were more likely to participate in other organized physical activities such as martial arts, dance, gymnastics or soccer lessons. Residents of Guadalajara were more likely to participate in other organized physical activities compared to residents of Puerto Vallarta and Mexico City. The overall model was significant (chi2 (8) =40.78, p<.001). The logistic regression did not support gender as a significant moderator of parental perception of safety at school and child participation in other organized physical activities (Wald (1) =1.63, p=0.201). The study sought to examine the relationship between parental perception of safety at school and child gender on physical activity. An additional aim was to determine if child gender moderated the relationship between parental perception of safety at school and child PA. While the hypotheses that parental perception of safety would influence children's physical activity levels was not supported, it was found that girls participated less than boys in all three measures of PA. The results indicated that girls were less likely to participate in outside play than boys. Most of the data collected in Mexico on children's physical activity demonstrates that boys are more active than girls.2 This finding is of particular importance because it contributes to the small existing body of data concerning the influence of gender on PA levels among children in Mexico. Additional studies examining gender differences and the underlying causes for those variations in outdoor play would provide a valuable contribution to the science particularly in this population. Our hypotheses that parental perceptions of safety at school would influence children's physical activity levels in Mexico was not supported. The findings of the current study do not negate parental perception of safety as relevant in examining physical activity in children, as previous research has found that parental perceptions of safety were significantly associated with increased likelihood of youth achieving appropriate levels of physical activity.20 Although the statistical analysis did not indicate that gender moderated the relationship between parental perception of safety at school and PA measures, previous studies have found that parent's perceived risk of their children being harmed significantly mediated the relationship between perceived safety and avoidance of physical activity among girls only.21 This conflicting evidence supports the need for further research examining parental perception of safety on children's PA levels, and it should consider issues specific to the Mexican population. Our finding that girls were less likely than boys to participate in sports teams and other organized physical activity is consistent with one longitudinal study that also found boys were more likely than girls to participate in organized sports.22 While it is unclear why this gender gap exists in Mexico, research in the United States has indicated issues with less access to participation in sports for girls and a continued presence of social stigma against girls in sports.23 Future research should explore reasons for the gender gap in sports participation and organized physical activity in Mexico. Sports participation among children in Mexico itself is limited with a reported 59% of Mexican children not participating in organized sports in the past 12 months.24 This was supported by the finding in the current study that 54.6% of children did not participate in sports teams. While there are many possible reasons for this, the structure of the schools operating in shifts has been suggested as a reason for the low numbers with the rationale that this school structure makes extracurricular PA not possible.25 The Mexican Report Card on Physical Activity for Mexican children and youth has identified creating larger numbers of extracurricular programs, building public spaces apt for safe sports, and encouraging participation in organized sports as recommendations for action.2 Additional research examining the cause for the lack of participation in organized sports is necessary. Strengths of this study include a large sample size across multiple cities in Mexico. A limitation of the study was the measure of safety. Parental perception of safety was a question on the survey about safety at school. Perhaps if the question had examined another indicator of safety, perception of safety would have been a significant variable in more of the physical activity measures. An additional limitation of the study is the subjective measurement of physical activity with a questionnaire. PA levels could have been more objectively measured with accelerometers; however, they were beyond the scope of the resources available for this study. These results are consistent with those of others suggesting that gender gaps exist in physical activity in Mexican children. We have established that gender is a significant contributor to children's PA levels, but it is important to understand the nature of that relationship so that interventions may be designed accordingly. Further research investigating the elements of safety and gender is necessary to increase physical activity levels in the understudied Mexican population. AH, ES, and RL participated in the study design, performed statistical analysis, and drafted the manuscript. SB provided critical revisions of manuscript and feedback on statistical analysis. ES, LL and EJ participated in recruitment of study participants and data collection. JT participated in recruitment of study participants. All authors reviewed and approved a final draft of the manuscript. This work made possible by a Fulbright-García Robles Core Scholar Fellowship awarded to Dr. Lee, the Canadian Institutes for Health Research and the Public Health Agency of Canada. This research was supported by funding from the National Institutes of Health/National Institute on Nursing Research (NIH/NINR), award T32 1T32NR012718-01 Transdisciplinary Training in Health Disparities Science (C. Keller, P.I.). The content is solely the responsibility of the authors and does not necessarily represent the official views of the NIH or the NINR. 1. World Health Organization Geneva Switzerland: Health topics: Physical activity. [Internet] [consulted 2015 January 5]. Available in: http://www.who.int/topics/physical_activity/en/. 2. Tremblay M, Gray C, Cowie-Bonne J, Janssen I, Lopez Y, Taylor J, et al. The Mexican report card on physical activity for Mexican children and youth [Internet]. Tlaquepaque, Jalisco, México, 2014 [consulted 2015 June 18]. Available from: http://www.academia.edu/7750007/The_mexican_report_card_of_physical_activity_in_children. 3. Rodriguez-Martinez M, Galaviz KI, Juaregui-Ulloa E, Gonzalez-Casanova I, Ricardo Lopez, Taylor J. Results from Mexico's 2014 report card on physical activity for children and youth. J Phys Act Health 2014;11:74-78. 4. Molnar B E, Gortmaker SL, Bull FC, Buka SL. Unsafe to play? Neighborhood disorder and lack of safety predict reduced physical activity among urban children and adolescents. Am Journal Health Promot 2004;18:378-386. 5. United States Department of State. Bureau of Diplomatic Security Overseas security advisory council [Internet]. Washington, DC: Mexico 2015 crime and safety report [consulted 2015 June 15] Available in: https://www.osac.gov/pages/ContentReportDetails.aspx?cid=17114. 6. World Health Organization. Geneva Switzerland: Mexico: WHO statistical profile. [Internet][consulted 2015 June 18]. Available from http://www.who.int/gho/countries/mex.pdf?ua=1. 7. Farley TA, Meriwether RA, Baker ET, Watkins LT, Johnson CC, Webber LS. Safe play spaces to promote physical activity in inner-city children: results from a pilot study of an environmental intervention. Am J Public Health 2007;97:1625-1631. 8. Mendoza JA, Watson K, Nguyen N, Cerin E, Baranowski T, Nicklas TA. Active commuting to school and association with physical activity and adiposity among US youth. J Phys Act Health 2011;8:488-495. 9. Rodriguez-Oliveros G, Haines J, Ortega-Altamirano D, Power E, Taveras EM, Gonzalez-Unzaga MA, Reyes-Moralez H. Obesity determinants in preschool children: Parental perceptions and practices related to feeding and physical activity. Arch Med Res 2011;42:532-539. 10. Tappe K, Glanz K, Sallis J, Zhou C, Saelens B. Children's physical activity and parents' perception of the neighborhood environment. Neighborhood impact on kids study. Int J Behav Nutr Phys Act 2013;10:39. 11. Carson V, Kuhle S, Spence JC, Veugelers PJ. Parent's perception of neighbourhood environment as a determinant of screen time, physical activity and active transport. Can J Public Health 2010;101:124-127. 12. Salvo D, Reis RS, Rivera JA, Martorell R, Pratt M. Characteristics of the built environment in relation to objectively measured physical activity among Mexican adults. Prev Chronic Dis 2014;11:1-16. 13. Jauregui, A, Villalpando S, Rangel-Baltazar E, Lara-Zamudio YA, Castillo-Garcia MM. Physical activity and fat mass gain in Mexican school-age children: A cohort study. BMC Pediatrics 2012; 12:109. 14. Jennings-Aburto N, Nava F, Bonvecchio A, Safdie M, Gonzalez-Casanova I, Gust T, Rivera J. Physical activity during the school day in public primary schools in Mexico City. Salud Publica Mex 2009;51:141-147. 15. Carver A, Timperio A, Hesketh K, Crawford D. Are children and adolescents less active if parents restrict their physical activity and transport due to perceived risk? Soc Sci Med 2010; 70;1799-1805. 16. Gharib H, Galaviz K, Lee R, Safdie M, Tolentino L, Barquera S, Levesque L. The influence of physical education lesson context and teacher behavior on student physical activity in Mexico. Retos 2015;28:160-164. 17. Secretaría de Educación Pública. Directorio de escuelas. [Internet];2010 [consulted 2015 June 18]. Available in: http://www.sep.gob.mx/es/sep1/directorio_de_escuelas#.VYL8bkaguv9. 18. Thiagarajah K, Hoelscher D, Bai Y, Leone A, Shertzer J, et al. Validiting the food behavior questions from the School Physical Activity and Nutrition Questionnaire. J Nutr Educ Behav 2008;4:305-310. 19. Sallis J, Strikmiller P, Harsha D, Feldman H, Ehlinger S, Stone E, et al. Validation of interviewer- and self-administered physical activity checklists for fifth grade students. Med Sci Sports Exerc 1996;28:840-851. 20. Bacha JM, Appugliese D, Coleman S, Kaciroti N, Bradley RH, Corwyn, RF, Lumeng JC. Maternal perception of safety as a predictor of weight status: the moderating effect of gender and assessment of potential mediators. Int J Pediatr Obes 2010;5:72-79. 21. Carver A, Timperio A, Crawford D. Perceptions of neighborhood safety and physical activity among youth: The CLAN study. J Phys Act Health 2008;5:430-444. 22. Vella SA, Cliff DP, Okely AD. Socio-ecological predictors of participation and dropout in organized sports during childhood. Int J Nutr Phys Act 2014;11:62. 23. Women in Sports Foundation. Factors influencing girl's participation in sports. [Internet] [consulted 2015 June 18]. Available in: http://www.womenssportsfoundation.org/home/support-us/do-you-know-the-factors-influencing-girls-participation-in-sports. 24. Gutierrez JP, Rivera-Dommarco J, Shamah-Levy T, Villalpando-Hernandez S, Franco A, Cuevas-Nasu L. Encuesta Nacional de Salud y Nutrición 2012. Resultados Nacionales. Cuernavaca: Instituto Nacional de Salud Pública, 2012. 25. Oria M, Sawyer K. The National Academies Press, Joint US Mexico workshop on preventing obesity in children and youth of Mexican origin. [Internet] [consulted 2015 June 18]. Available in: http://sites.nationalacademies.org/cs/groups/internationalsite/documents/webpage/international_053819.pdf. 26. Ciclovias Recreativas de las Americas. Mexico City's Ciclovia: a very including and democratic exercise. [Internet] [consulted 2015 June 18]. Available in: http://www.cicloviasrecreativas.org/en/news/ciclovias2/4687-muevete-en-bici-a-very-including-and-democratic-exercise. 27. US Department of State Bureau of Consular Affairs. Washington DC. US Passports and international travel. Mexico Alerts and Warnings. [Internet] [consulted 17 June, 2015] Available in: http://travel.state.gov/content/passports/english/country/mexico.html.